Ghana captain Asamoah Gyan is hoping he can add a happy chapter to his Africa Cup of Nations story when he leads the Black Stars in Equatorial Guinea. The 29-year-old will be attending his fifth Nations Cup finals and is keen for it to be a positive one given his chequered history with the tournament. Ghana have been handed a tough draw for the tournament in Group C with Africa's top-ranked side Algeria, Senegal, who are also among the top ten sides on the continent, as well as South Africa, who reached the competition unbeaten. But even that has not shaken Gyan's early confidence, despite the cautious tone of the Ghana Football Association which has said new coach Avram Grant must "do well" at the tournament and suggested asking him to win it will be unrealistic. "All three countries in our group are in very good form," Gyan told BBC Sport. "South Africa did not lose a single game and Algeria have been very, very good. They are all looking great and that will make the tournament very difficult for us but we are confident. "We are going to Equatorial Guinea to win the trophy. It is the attitude we go to every tournament with. It is always as simple as that. A lot will depend on us, the players, and hopefully we can make things easy for the new coach," he added. Gyan has experienced more than most at the Nations Cup. In 2008 Ghana failed to deliver on home soil and Gyan came in for severe personal criticism after failing to score. He says it drove him to the point of wanting to quit the team's camp. "I am mentally strong now because of that tournament in 2008," he said. "It was the first time I had to deal with intense criticism. It hurt me but made me a strong man. Every time I go onto the field now it is between me and my critics. That is how I psyche myself these days." Gyan returned to the Nations Cup two years later and was Ghana's star man, scoring winning goals against Angola and Nigeria in the quarter-final and semi-final as the Black Stars reached the final. Although they lost the final 1-0 to Egypt, Gyan thought he had rid himself of his personal Nations Cup demons. Instead they were to return with a vengeance in 2012. Ghana had been tipped to beat Zambia in the semi-finals but Gyan missed an early penalty and his side went on to lose 1-0. It was a second helping of spot-kick misery for Gyan, who also failed to convert in the 2010 World Cup quarter-final against Uruguay, who went on to win the game. 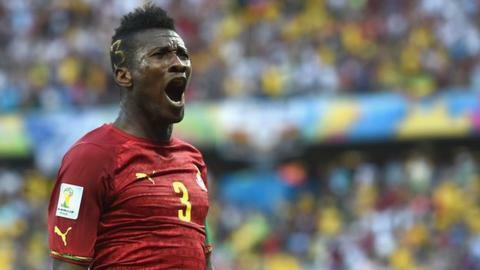 Gyan says the failure to convert the penalty at the Nations Cup hurt more than the miss against Uruguay. In January 2013 Gyan revealed: "I said some months back that I wouldn't take another penalty. Before my Mum died [in November 2012] she told me not to take penalties any more." "Everyone knows about me and the Nations Cup now I guess", said Gyan. "I think when it comes to the history of the tournament and Ghana, I will feature somewhere. "I felt down. I was really down. I felt like I had let Ghana down for a second time in that crucial moment. "The penalty could have taken us to the final. It was early in the game but I think if that ball went in it would have boosted our confidence. "I felt I let everybody down and that is why I took time off the national team. I am mentally strong but that day I was sad, I locked myself in the room and cried. "In South Africa at the World Cup I felt it was a normal thing with penalties, it is either you miss or you score. The following day I was ok. Great players miss every time so it happens. "The second time I missed (at the Nations Cup) I was like 'not again, I cannot keep letting people down'. I felt like I'd gone from a hero to zero, that I had undone all I had toiled for in a second." After a self-imposed exile from the national team, Gyan returned to captain the Black Stars and he is eager to lead his country to a long-awaited fifth title - they were the first team to win the tournament four times but have not lifted the trophy since 1982. "Our main focus is to lift the cup. It is not all about me but it is all about the team. Even if I don't get the tournament I want and Ghana wins the cup I will be proud. That is what we are preparing for," he said.